So you forgot / lost your password and need to update your workbook tabs or structure? 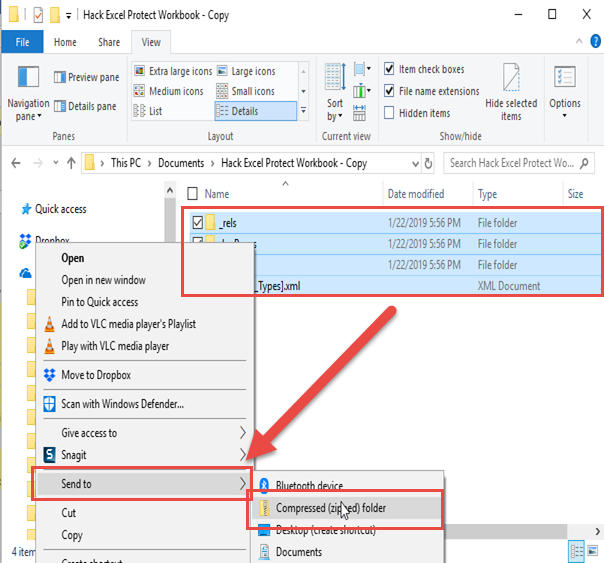 Well don’t cry, don’t complain, we can Hack Excel Protect Workbook feature with this simple trick. 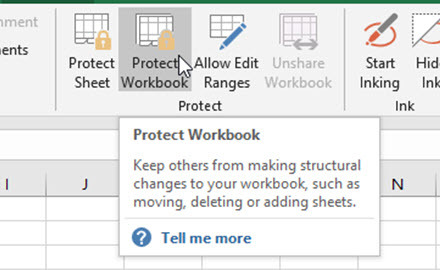 So what would you want to use the Excel Protect Workbook feature? This feature locks users from editing the structures of the workbook. 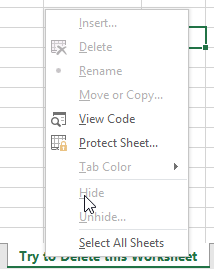 Like Unhiding or Hiding Worksheets, Changing Tab Colors, Move or Copy Worksheets, Renaming Worksheets, Inserting or Deleting Worksheets. But some times you forget the passcode you set and you need to hack the Excel Password you set. First, we need to modify the extension of the Excel file to a .ZIP file. Essentially, if you didn’t know, all Excel files are just a mashup of several XML files. All your data and settings are in these files. Excel is a zipped file of these files, but to have Excel run/modify the file, you need an .XSLX file extension. 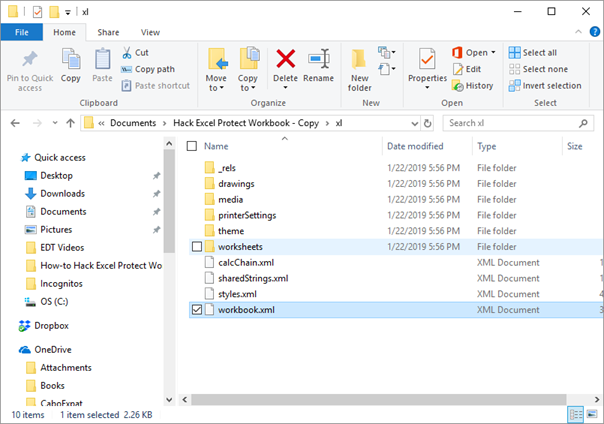 In order to Hack Excel Protect Workbook feature, we need to see these files. The easiest way to do this is to open Windows File Explorer and locate the Excel Workbook you want to Hack. 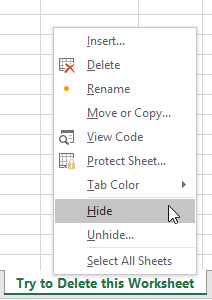 Next, make sure you have your Show/Hide Options turned ON for “File Name Extensions” as you see here on the View Menu within the Windows File Explorer. NOTE: If you do NOT have this option enabled, if you try and rename the file, it will not work unless you are changing the actual extension. A simple rename will only make your file like this: “Original.xlsx” to “Original.zip.xlsx”. 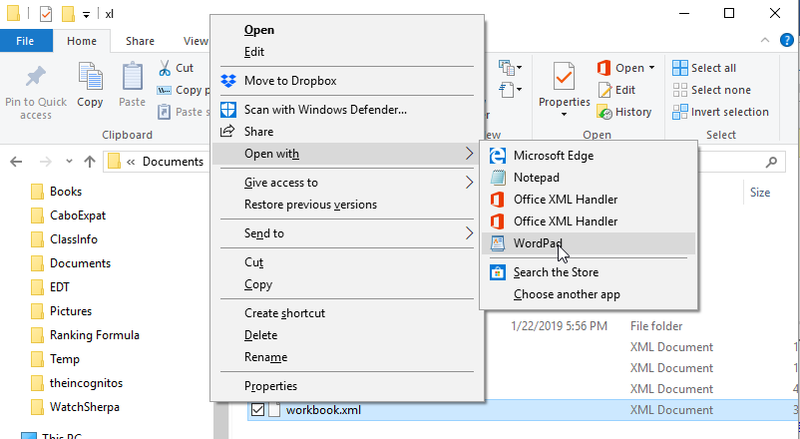 If you are showing “File Name Extensions” in Windows File Explorer, this is an easy step. Just change the name from Filename.xlsx to Filename.zip. Press OK when prompted to change the file extension. 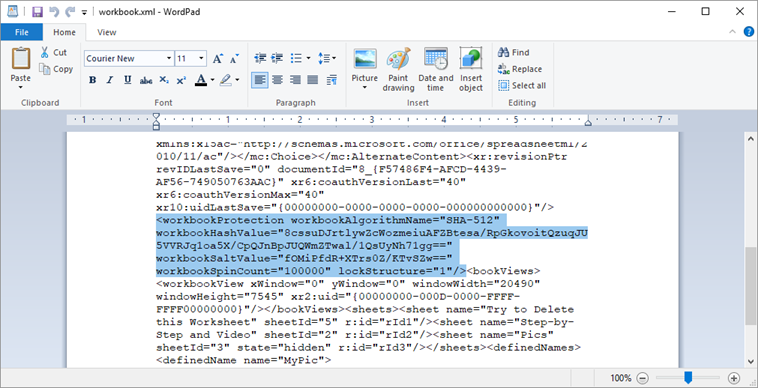 and find the “workbook.xml” file. Then right click and choose “open with” from the popup menu and pick WordPad or NotePad as your editor. I am using WordPad here. In this file we need to find the following text “<workbookProtection”. Once you have found that, locate the very next “>” text. 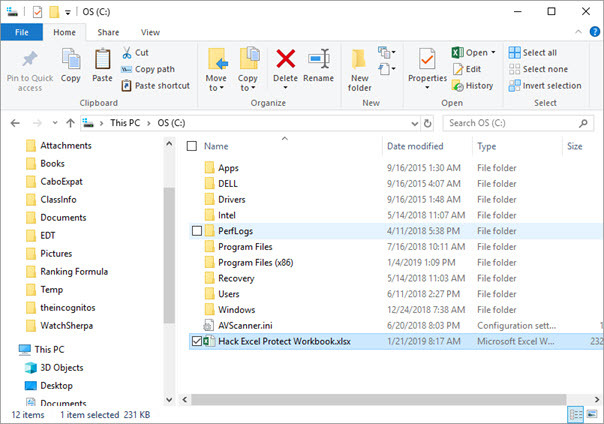 Highlight and delete from the “<workbookProtection” to “>” as you see here. Then save the file. 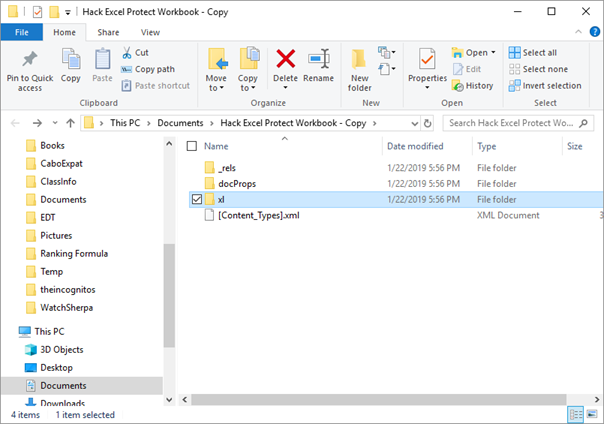 The last of the Hack Excel Protect Workbook steps is to rename the .Zip file back to .XLSX and make Excel open the grouping or xml files. 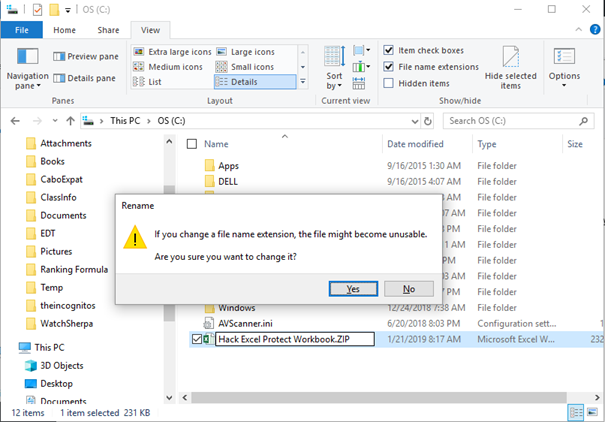 Simply change the extension in Windows File Explorer from zip to xlsx. Your Hack is now completed and you can now change the structure of your spreadsheet. Note: This will not hack Excel File Encryption. To break this, the only solution I have seen is to buy a software program. But let me know in the comments below if you have another solution. Here is a quick Video tutorial on the Excel hack techniques presented above. Now you know a lot more on how Excel builds your file and how you can use that knowledge to your advantage. Let me know in the comments below if you know of any other techniques I should share on the site.